There was quite a bit of economic data released last week - here are a few highlights: U.S. manufacturing appeared to stumble in January as factory output fell 0.4%, according to a Federal Reserve report. However, production was much higher in the final months of 2012 than expected, indicating that this could be a temporary setback. [ii] Europe is weighing on markets as a disappointing GDP report showed that the economies of France, Germany, Greece, Italy, and Portugal all contracted in the fourth quarter of 2012. As a result, the fourth quarter Eurozone GDP shrank 0.6% compared with the third quarter. [iii] On the positive side, consumer confidence beat expectations with a significant bump in January as Americans responded enthusiastically to the resolution of the fiscal cliff. Households earning less than $75,000 were among the most optimistic about the future, belying economists’ concerns about the weight of payroll taxes among this group. [iv] On the whole, we think the general trend shows that the economy is still plowing forward, despite concerns about budgets and federal spending. Looking farther ahead, we’re anticipating some market headwind in the form of the March 1 sequestration deadline that is fast approaching. This automatic series of federal spending cuts was temporarily extended in January during the fiscal cliff wrangling to allow Congress and the President more time to negotiate. However, with no resolution thus far, and Congress in recess this week, it appears as though the deadline may pass with no action. [vi] Although markets have been ignoring the news thus far, the effects of sequestration in massive federal budget cuts, lost jobs, furloughs, and defense cuts[vii] would very likely have a negative effect on markets. While we never try to make definite predictions, we’re keeping a close eye on what’s going on in Washington and will keep you informed. As always, we focus on the long term while taking advantage of opportunities as they present themselves. 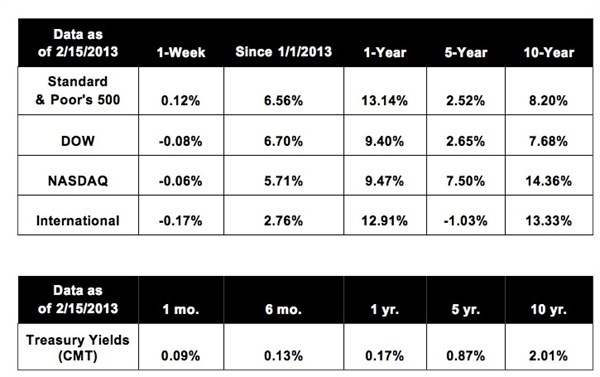 Notes: All index returns exclude reinvested dividends, and the 5-year and 10-year returns are annualized. Sources: Yahoo! Finance, Treasury.gov. International performance is represented by the iShares MSCI EAFE Index Fund (ETF). Past performance is no guarantee of future results. Indices are unmanaged and cannot be invested into directly.